Aberdeen-based standby vessel operator Atlantic Offshore Rescue has secured contracts in the last few weeks with major oil companies worth a combined £12million. 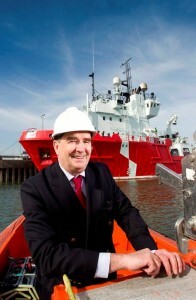 The vessels will provide support in the UK North Sea for Shell, Nexen, Hess and Talisman Energy (UK) Limited. Atlantic Offshore has been in operation since 1995 and manages a fleet of nine emergency response and rescue vessels (ERRVs) and four platform supply vessels (PSVs) out of Aberdeen. John Bryce, managing director of Atlantic Offshore, said: “We enjoy a long-standing working relationship with Shell and are delighted that they have contracted our vessel once again. In addition to Hess and Nexen, who are returning clients, we are pleased to have secured a contract with new client Talisman and we look forward to demonstrating our safety standards onboard whilst building strong relationships with these companies. “We have invested heavily into our fleet and staff training and are dedicated to continuing to do so. All of our nine ERRVs are currently fully utilised and we anticipate expanding the fleet with further vessels in the near future to meet client demand. “It has been a very positive year to date and we look forward to strengthening our presence within the oil and gas industry under our new Atlantic Offshore Rescue branding. I am pleased that our good reputation is attracting new clients and we look forward to a long and safe working partnership with them,” he continued. The company employs 350 people (approximately 330 seamen and 20 office-based staff) and provides multi-role offshore and emergency rescue and response vessels for many of the oil majors operating in the North Sea. The company’s aim is to continue to expand its standby and emergency response capabilities within both the Norwegian and British sector of the North Sea and to be able to provide cross-border solutions reflecting the needs of its clients. Atlantic Offshore Rescue is part of the Atlantic Offshore Group which is based in Norway.